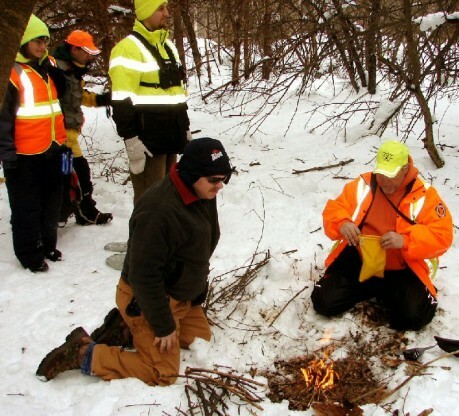 FULTON, NY Ã¢â‚¬â€œ The Oswego County Pioneer Search and Rescue Team practiced some winter survival techniques over the weekend. The group met at the Great Bear Recreation Area. Above, kneeling from left, Kari Lawton and Tim Thomas practice starting a fire in wet snowy conditions. 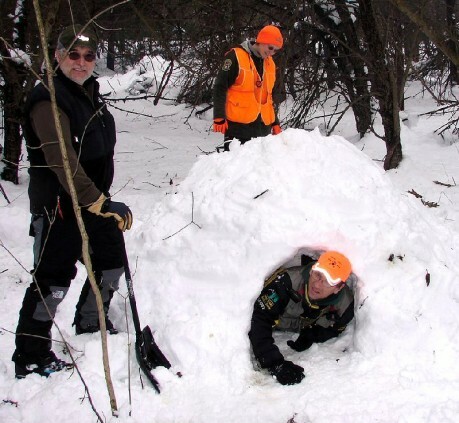 Below, Joe Homola, instructor (left), talks about the construction of a snow shelter and explains how persons can protect themselves from the elements safely inside the shelter. Ray Hines is in the snow shelter and Eileen Teeter (orange vest) is in the background.